It doesn't feel like fall in Louisville until you have wandered through countless art vendors among one of the country’s largest collection of Victorian homes. The St. James Court Art Show® is a juried fine arts and contemporary crafts show featuring over 700 artists from around the U.S. in the heart of historic Old Louisville! This 4-square block, outdoor art show takes place annually on the first weekend of October, Friday, Saturday and Sunday. 2018 will be the 62nd annual St. James Court Art Show. This art fair is a great (and free!) way to show off the stunning architecture of old Louisville. Show hours are: 10am - 6pm Friday & Saturday, 10am - 5pm on Sunday. Check out their Facebook page for more info! A Jack O’Lantern show so big you won't believe it! 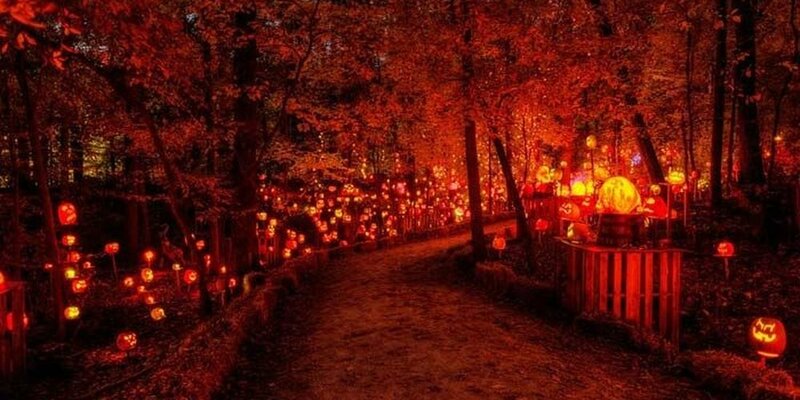 Celebrating its 6th year, the Iroquois Park Jack O’Lantern Spectacular is held in Iroquois Park with 5,000 carved pumpkins lining a ¼-mile walking trail, illuminated at night as an “art show”. Voted as The Best Halloween Event in the Midwest by Citynova, this is a family-friendly Louisville event you don’t want to miss! Interested in a corporate outing? They offer group ticket packages and group dinner packages! The show runs daily from dusk to 11 p.m., during the week (Sunday-Thursday), and closes at midnight on Friday & Saturday. Click here for more info! Centered in the small-town ambiance of Gaslight Square, the Gaslight Festival in Jeffersontown festival has evolved into a time-honored tradition of Jeffersontown. Over 100 arts and crafts vendors travel from across the country to showcase their talents, and over 100 area business, civic and nonprofit organizations come to spread awareness at this 3-day event. More info on the festival here. The twenty-sixth annual Kentucky Bourbon Festival® hosts visitors from all around the world. The extensive Event Schedule from September 12 – 16 offers classes like “A Whiskey & Its Grains”, an in-depth class that examines how each individual grain can greatly affect the spirit that comes off the still, to seminars on Bourbon Cocktail Mixology™. A family-friendly event with a variety of interactive games, inflatables, train rides and more – this is a great event to explore the historic town of Bardstown. Click here for events and schedule! With the Breeder’s Cup being hosted at Churchill Downs this year, the Fall Meet is sure to be an exciting time! Take your out-of-town guests to Dawn at The Downs Breeders' Cup on Thursday, November 1st to see the Breeders' Cup contenders train for the big races, listen to expert commentary and enjoy a hearty Kentucky breakfast in their dining rooms. Or celebrate Thanksgiving weekend at the track with a traditional buffet and 7 exciting Stakes races, including up-and-coming Kentucky Derby hopefuls. Every Wednesday through Sunday in November will have races that start at 1 p.m. and continue through the evening. This is a great time to take your out-of-town guests who have never been to historic Churchill Downs! With cooler weather and fewer crowds than Derby Season, this is a sure way to make a memorable experience. For more featured events, check out their website. Bluegrass Jamfest and Band Scramble – Saturday, November 10th, 11:00 am - 3 p.m. Pack a lawn chair and come out for this one-of-a-kind bluegrass event! Musicians enter this scramble individually and bands are created by picking names out of hats - one for each instrument. The new band will then have a 20-minute practice session to prepare songs and stage patter for a six-minute turn on the stage in front of a live audience. The winner will be chosen based entirely on audience response, so make sure your prepared to make some noise! Endris Lodge in Lapping Park - 2404 Greentree North, Clarksville, IN – More info here. We hope you enjoy these Louisville Fall Events!